The Z1 has a robust feel to it, mainly due to its metal-body construction, but also because of its fullheight metal front panel, which slides across to protect the lens and flash, turning the camera off in the process. The large, 2.5-inch LCD on the back panel is the most fragile element but even this has a scratch-resistant coating. Controls are basic but well laid out, enabling quick and easy operation. 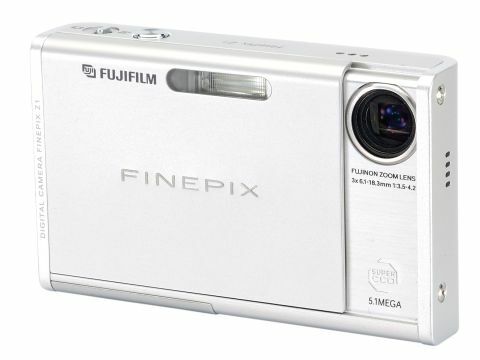 The feature list looks a little bland compared to some of the latest ultra-compact cameras but FujiFilm nevertheless claim that its new 'Real Photo' processor and a special 5th Generation Super CCD-HR 5.1Mp sensor, along with Fujinon lens optics, provide for ultra-high sensitivity, low noise, faster operational speeds and reduced power consumption. There's no built in memory in the Z1 but you do get a 16MB memory card with the camera, although that's only sufficient for about six shots in top quality mode. The camera also uses xDPicture Cards, in preference to the far more popular SD/MMC format, so memory cards tend to be slower and more expensive to buy. At least there's a docking station supplied in the box, which makes for civilised recharging of the battery and easy file transfer to your PC. True to its word, the Z1 is quick on the uptake with a very fast start-up time and seriously low shutter lag. However, image quality for both indoor and outdoor shots was decidedly average in our tests. There appeared to be a slight lack of sharpness compared with much of the competition and higher levels of digital noise afflicting some images. There's no denying that the Z1 is aggressively priced but if it's outright photo quality you want, you're better off spending a little extra.